Next week's US-North Korea summit shows that Singapore enjoys trust and confidence as an honest and neutral moderator and host, Minister for Foreign Affairs Vivian Balakrishnan has said. He was speaking on Tuesday at the end of a one-day working visit to Washington, where he met Secretary of State Mike Pompeo and National Security Adviser John Bolton. The Foreign Minister will be in Pyongyang today at the invitation of his North Korean counterpart, Mr Ri Yong Ho. Before leaving the US capital, Dr Balakrishnan told Singapore media that hosting the summit was "our contribution to world peace". "I am confident we will do our best as hosts. I tell both the North Koreans and the Americans, we are there to serve tea and coffee," he quipped. US President Donald Trump and North Korean leader Kim Jong Un, whose official title is Chairman of the State Affairs Commission, are scheduled to meet at the Capella hotel on Sentosa at 9am on June 12, in what is being touted as potentially one of the most significant geopolitical developments since the end of the Cold War. "The fact that the summit is even occurring is significant in its own way," Dr Balakrishnan said. "For the President of the United States to sit with the leader of North Korea across the table and to have all the issues laid out for them to have a frank discussion is a significant step. "Obviously, what all of us are hoping for is it would lead to a de-escalation of tension, raise the prospects of peace, and for the sake of the North Koreans themselves improve the prospects for economic development," he said. "For North Korea, they only need to look at China and at South-east Asia to see that peace is an essential prerequisite for prosperity, so let's hope for the best but not have undue expectations," Dr Balakrishnan said. "I don't think one meeting next week in Singapore can certainly unlock the entire situation on the Korean peninsula, (but) if you can make a positive step, it will be significant in its own right," he added. The Foreign Minister also disclosed that it was the US that approached Singapore first, followed by North Korea, to host the summit. The first prerequisite for both sides was security, followed by the availability of a venue and a setting that would send the appropriate signal. "We have been able to have good discussions separately with both; I think it is very important that we enjoy the trust and confidence of both parties, this ability to be an honest neutral moderator and host was absolutely crucial," he said. Mr Pompeo and Mr Bolton had thanked Singapore and Singaporeans, Dr Balakrishnan said. Separately on Tuesday, White House Press Secretary Sarah Huckabee Sanders tweeted: "We thank our great Singaporean hosts for their hospitality." Dr Balakrishnan's talks with US officials went beyond the upcoming summit to cover US-Singapore relations as well as trade issues. On trade, he said he voiced Singapore's concern over the prospect of trade wars. The Trump administration, citing national security and unfair trade barriers, has imposed tariffs on a range of imports from several countries which, in turn, have threatened to retaliate. "From Singapore's perspective, we hope it will not be a full-blown trade war because it will inevitably affect us," Dr Balakrishnan said. "Singapore is a place where our trade is three times our GDP, and any disruption to world trade will be a problem for us; I made that point as strongly as I could." He added: "We think even when there are disputes, we prefer they be resolved through multilateral institutions and multilateral processes. We are not in favour of unilateral measures, (and) we certainly don't want trade wars." The historic summit between US President Donald Trump and North Korean leader Kim Jong Un will be held at the Capella Hotel on Singapore's resort island of Sentosa, the White House has announced. When organisers of the Trump-Kim summit scout for a venue, one simple but critical ingredient is a room with multiple doors. Protocol dictates that President Donald Trump of the United States and Chairman Kim Jong Un of North Korea should not enter via the same entrance for their bilateral meeting - to avoid the perception that one arrived first and is "waiting" for the other. This is just one of the many intricacies of hosting the June 12 summit, during which a sitting American president and a North Korean leader will meet for the first time since the Cold War that saw Korea split into two. On the table for discussion are, among other issues, a possible denuclearisation deal. With such high stakes involved, the smallest detail can be sensitive and it is paramount that an appearance of parity be achieved, say past and present diplomats and protocol officers, as well as international relations scholars interviewed. But they add that if any country can pull it off, it is Singapore, an old hand at organising other high-level events - including two historic China-Taiwan meetings in 1993 and 2015, the annual Shangri-La Dialogue and Asean meetings. Singapore's role, as host, is "to provide a peaceful, safe and conducive environment for the summit", Ambassador-at-Large Ong Keng Yong tells The Sunday Times. "The host should also be ready to provide any other assistance as requested by the two sides, provided that this is within the ability of the host to provide," he adds. What Singapore offers is a backdrop, say those interviewed. "It is not our meeting nor our show," says Mr Nicholas Fang, director of security and global affairs at the Singapore Institute of International Affairs. As one former Ministry of Foreign Affairs (MFA) diplomat, who declined to be named, quips: "We only provide the tea and coffee." But serving tea and coffee is not as simple as it sounds. No detail is too small. For one thing, that coffee. Many foreigners are not used to the local Nanyang coffee, notes a retired MFA protocol officer with a smile. An international brew has to be served instead. Many other behind-the-scenes considerations have to be thought through, from security to logistics to ensuring - as Dr Alan Chong of the S. Rajaratnam School of International Studies (RSIS) puts it - "an atmosphere of visible equality". "It is a complex operation and we should salute our officers who are dealing with the preparations," says Mr Ong, noting that multiple ministries and agencies will be involved. These include the Foreign Affairs, Home Affairs, Defence, Communications and Information, and Transport ministries and agencies. Dr Graham Ong-Webb of RSIS notes that Singapore is taking charge of the form and not the substance of the summit - but added that the form can be very important, as it ensures that "on an emotional, psychological and mental level, the people doing the discussing are in the best possible setting". "Protocol can make or break summits," he adds. This is why, prior to the summit, there will be discussions between Singapore and both parties, "which would allow us to better understand the situation, including possible sensitivities", says Mr Ong. With just a week left before the meeting, such preparations are now in full swing. The need for Singapore to foster an air of equality between the two visiting leaders begins the moment their planes land, says Dr Chong. If President Trump's Air Force One looks much more impressive than the plane Chairman Kim arrives in, the Koreans may insist the press not be allowed to cover the airport arrival. 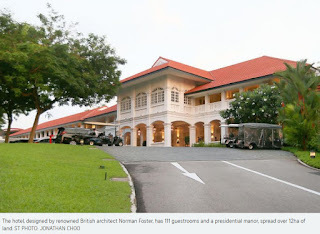 The journalists could then be invited to only the official reception at the Istana. The cars they ride in must also be equally dignified. The Americans bring their own cars along on their overseas trips - including the armoured presidential "The Beast", a Cadillac. The North Koreans, meanwhile, may have to rent from a local company cars that look comparable to the American sedans. Based on diplomatic convention, each of the two leaders will be accompanied by a Singapore Cabinet minister during the trip. The importance of parity is also why, despite initial chatter of the summit taking place at Marina Bay Sands, this is unlikely to happen, says Dr Ong-Webb. It is owned by American magnate Sheldon Adelson, a friend of President Trump. Holding the meeting there could compromise the air of neutrality and equality, he says. Also, neither leader should stay at the summit venue - again, so nobody is seen as a host receiving his visitor. For now, word is that President Trump may stay at Shangri-La Hotel and Chairman Kim could stay at The Fullerton Hotel - with the summit likely to be held at Capella Hotel or another hotel on Sentosa. Also potentially contentious is the question of who gets a seat at the main table for any banquet. The retired protocol officer says he once saw a round table set up to fit 36 guests - to avoid disagreements. He added that the South Korean media has been known to publish complete graphical guides on who is sitting where at such banquets. Such details will be important in this summit, given Singapore's longstanding ties with the US. Mr Fang says: "Singapore's relationship with the US is ostensibly broader and deeper than its ties with North Korea, but it cannot be seen to give preferential treatment to any party." The North Koreans may be especially sensitive, says Dr Ong-Webb. North Korea is frequently treated as a rogue state and often finds itself having to "negotiate its sovereignty" on the international stage. As host, Singapore succeeds if the North Koreans feel respected here, he adds. Another reason Singapore was chosen as the venue for the summit is its tight security, say analysts. Singapore is known for its good border security and its ability to lock down meeting venues, says Dr Ong-Webb. He cites the case of a Gurkha officer shooting dead a driver who failed to stop at a checkpoint during the Shangri-La Dialogue in 2015. For security experts, this case provides further evidence that security here is "rock solid". That said, nothing can be guaranteed as security involves unknowables, says Dr Inwook Kim, an international relations expert at the Singapore Management University. The retired protocol officer says many foreign leaders bring along their own armed security personnel. They must declare to Singapore the arms and ammunition they carry, and will be issued a certificate after being informed of local rules of engagement. Singapore usually assigns armed officers to shadow them throughout the trip. Defence Minister Ng Eng Hen yesterday confirmed Singapore will bear the security costs of the summit, adding: "It's a cost we're willing to bear to play a small part." Finally, the smooth running of a summit also involves clockwork precision logistics. Leaders must not be made to wait in awkward silence - especially if the press is in view, says the retired protocol officer. One trick of the trade is to place them in holding rooms. Once ready, they will enter the meeting room at the same time. Another challenge of this summit is accommodating the international press contingent, which is likely to be huge, adds Dr Kim. Most summits of this magnitude are planned six months to a year in advance, analysts note. But this one is being put together in weeks. "There are also numerous international events taking place (at this time), including the Shangri-La Dialogue," says Mr Fang. "It would be fair to say... there is a fair amount of pressure and apprehension among all the stakeholders involved." But having hosted other sensitive events, Singapore officials would be attuned to the need to "take into consideration a full spectrum of factors", he adds. That said, one risk for Singapore is if the summit ends with no agreement, says Dr Chong. The two sides may, in addition to pointing fingers at each other, want to place some blame on the host, he adds. Another potential complicating factor: There have not been regular state visits between Singapore and North Korea - so officials may be less familiar with one another. But Dr Chong notes that there is a North Korean embassy here, so there would be some level of interaction. One last variable that could throw a spanner in the works: the unpredictable personalities of President Trump and Chairman Kim. They may - say, as a negotiating tactic - refuse to stick to a pre-agreed itinerary, says Dr Chong. "This will challenge the most well-rehearsed protocol. The Singapore officials will just have to play by ear. They must have not just Plan B, but Plans C and D as well." 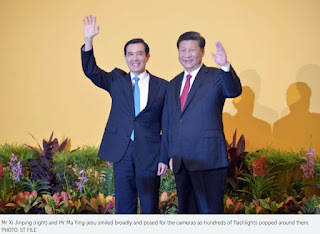 Singapore hosted a meeting between Chinese President Xi Jinping and then Taiwanese President Ma Ying-jeou in 2015. It was the first such summit since the Chinese civil war reached a stalemate in 1949. The meeting symbolised closer China-Taiwan ties, though no agreements or joint statements were made. The summit marked a delicate balancing act for President Ma, whose Kuomintang (KMT) party is friendlier to China, but which has to stay mindful of a growing desire among younger Taiwanese for more distance from the mainland. The meeting also happened two months before Taiwan's presidential election, with KMT trailing the pro-independence Democratic Progressive Party. Three members of an anti-China party from Taiwan who wanted to protest here were questioned by Singapore police. The Chinese delegation stayed at St Regis Singapore, while the Taiwanese delegation stayed at Four Seasons Hotel. The summit was held at Shangri-La Hotel. The two leaders began the summit with an 81-second handshake, witnessed by 600 journalists. They adjourned to another room for public remarks, followed by a closed-door meeting. As the two sides had not officially recognised each other, the leaders addressed each other as "Mister" and not "President". The two leaders later held separate press conferences. At dinner, each side brought famous spirits - Mr Xi's from Guizhou province, and Mr Ma's from Kinmen and Matsu, islands occupied by Taiwan since 1949. The bill for the summit venue and the meal was split equally down the middle - an outcome of pre-summit negotiations. The 1993 Koo-Wang talks were the first public meeting between China and Taiwan since the end of hostilities in 1949. Four agreements were inked, marking a new era of cooperation. The two sides, technically still at war, pledged to deepen business and cultural ties. They were represented by semi-official groups: China's Association for Relations Across the Taiwan Straits, led by Mr Wang Daohan, and Taiwan's Straits Exchange Foundation (SEF), led by Mr Koo Chen-fu. Mr Koo nearly resigned ahead of the meeting, as Taiwan's opposition sought to discredit him by branding his family traitors during the Japanese Occupation. The opposition was strongly opposed to reunification, which the Taiwan government said was not on the agenda. But Mr Wang caused a stir when he said just before the talks that "there is nothing we cannot... talk about". On the opening day of talks, 12 opposition Taiwan legislators came to challenge the SEF's right to represent the Taiwanese. More than 200 journalists were in Singapore to cover the three-day event held at the NOL Building in Alexandra Road. Much thought went into ensuring parity between the two sides. Four copies of the pacts were made: two in the traditional Chinese script running vertically, which is used in Taiwan, and two in simplified Chinese running horizontally, as used in China. The agreements also indicated the month and day of signing, but not the year, as the two sides used different calendars. Mr Koo and Mr Wang also swopped seats midway through the proceedings, due to a custom that considers the person seated on the right to be more senior. The United States paid tribute to Singapore's efforts in helping the Donald Trump administration plan for the proposed US-North Korea summit in Singapore on June 12. On Wednesday in the US, White House press secretary Sarah Huckabee Sanders said President Trump was "very appreciative" of the Republic's efforts. She said at a press briefing: "The advance team, led by Deputy Chief of Staff Joe Hagin, met with the North Korean team in Singapore earlier today, and again expect to do so tomorrow. "And we want to thank our strategic partner in Singapore, who has been incredibly generous in agreeing to host the summit. And the President is very appreciative of Prime Minister Lee (Hsien Loong) for all of their efforts." The sentiments echoed a similar statement by US State Department spokesman Heather Nauert, who a day earlier praised Singapore for its assistance. Ms Nauert said at a press briefing: "I just want to highlight the great work that the Government of Singapore has done and how much assistance that they have provided to the United States, especially Prime Minister Lee in particular, who has been gracious with his time, gracious with all their efforts in helping the United States to plan for this summit." Mr Trump also tweeted yesterday morning US time: "Very good meetings with North Korea." Apart from the Singapore meetings, US Secretary of State Mike Pompeo met General Kim Yong Chol, the right-hand man of North Korean leader Kim Jong Un, in New York on Wednesday. The comments came as senior North Korea and US envoys held talks for the second straight day. Mr Kim Chang Son, the de facto chief of staff of Mr Kim Jong Un, led the North Korean team as they continued discussions with the American delegation, headed by White House Deputy Chief of Staff Joe Hagin at the Capella Hotel on Sentosa. Yesterday's meeting lasted at least two hours. On Wednesday, the North Korean delegation spent more than four hours at the Capella. Sources said that the meetings in Singapore are to iron out the logistical details of the historic June 12 summit such as security, meeting venues and transportation, among other matters. Mr Kim Chang Son and Mr Hagin both arrived in Singapore on Monday. It is not known when they will leave the country. Mr Kim is believed to be staying at The Fullerton Hotel, which sources say could also play host to Mr Kim Jong Un when he arrives. The American delegation has been staying at the Capella, where speculation is rife that Mr Trump will also be checking into, in a fortnight. Sources told The Straits Times that the Shangri-La Hotel may be a possible venue to host the summit. However, it is also possible that if the delegations do indeed set up camp at the Fullerton and Capella, respectively, the meeting may take place at either hotel. The prospect of the meeting has already drawn a number of foreign journalists into town. The Straits Times understands that at least 2,000 media personnel are expected to cover the Trump-Kim meeting, which, if it takes place, will be the first time that a sitting US president will meet the leader of North Korea. United States President Donald Trump has cancelled his June 12 summit with North Korean leader Kim Jong Un, citing Pyongyang's hostility, and said the US military stands "ready if necessary". In a signed letter to Mr Kim yesterday, Mr Trump wrote: "Sadly, based on the tremendous anger and open hostility displayed in your most recent statement, I feel it is inappropriate, at this time, to have this long-planned meeting. 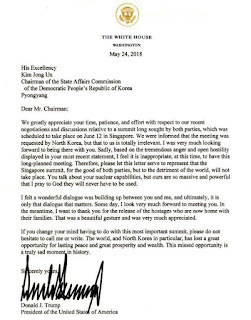 "Please let this letter serve to represent that the Singapore summit, for the good of both parties, but to the detriment of the world, will not take place. "This missed opportunity is truly a sad moment in history. Some day, I look very much forward to meeting you." He added: "If you change your mind having to do with this most important summit, please do not hesitate to call me or write." Speaking after releasing the letter, Mr Trump sounded a bellicose note. "Our military, which is by far the most powerful anywhere in the world, and has been greatly enhanced recently... is ready if necessary. "I have spoken to South Korea and Japan, and they are not only ready should foolish or reckless acts be taken by North Korea, but they are (also) willing to shoulder much of the costs of any financial burden and any other costs of a US operation." But the US President also made clear that he is still keeping open the possibility of a summit. "It is possible that the existing summit could take place or a summit at some later date. Nobody should be anxious, we have to get it right." Strong sanctions and the US-led "maximum pressure campaign" on North Korea will continue, he added. Global stocks fell sharply following the news of the cancellation of the summit. There was no reaction from North Korea by press time. South Korean President Moon Jae In, who convened an emergency meeting with top aides last night, expressed deep regret over the cancellation of the summit, but urged that "denuclearisation should not be delayed". An official from Japan's Ministry of Foreign Affairs said the letter from Mr Trump did not mean the US felt that the summit was not important. "The Japanese government will continue to align and coordinate policies between the US, Japan and South Korea, and we will keep closely watching the outcome." Singapore, which was to host the summit, said it regrets the cancellation of the meeting. The summit would have been the first-ever meeting between a serving American president and a North Korean leader. But differences remain between the two sides. Washington wants a complete, verifiable and irreversible denuclearisation of North Korea. But Pyongyang says it will never give up its nuclear deterrence until it feels safe from what it calls US aggression. North Korea hardened its rhetoric towards the US yesterday before Mr Trump's letter was released, lashing out at remarks by Vice-President Mike Pence that had compared the country with Libya. He had suggested Mr Kim risked the fate of toppled Libyan dictator Muammar Gaddafi if he did not make a deal. North Korean Vice-Minister of Foreign Affairs Choe Son Hui said in a statement: "I cannot suppress my surprise at such ignorant and stupid remarks gushing out from the mouth of the US Vice-President." Ms Choe added: "We will neither beg the US for dialogue nor take the trouble to persuade them if they do not want to sit together with us. "Whether the US will meet us at a meeting room or encounter us at a nuclear-to-nuclear showdown is entirely dependent upon the decision and behaviour of the United States." US President Donald Trump's personally dictated letter to North Korean leader Kim Jong Un may have been abruptly released with no notice to US allies. Possibly unprecedented for an American president - though not entirely for Mr Trump - it also contained a thinly veiled but very firm threat of nuclear war with its reference to the "massive and powerful" nuclear capability of the United States. Yet, it also tried to give credit to Mr Kim, in the personal and sometimes exaggerated flourishes that Mr Trump is well known for. He described Mr Kim's release of three jailed Americans as a "beautiful gesture", for instance. The letter followed protocol, referring to Mr Kim by his formal designation of Chairman of the State Affairs Commission of the Democratic People's Republic of Korea, the country's formal name. It began with courtesy and appreciation, but also made the point that the meeting was requested by North Korea. It pointed out that the summit in Singapore would have been good for both parties. It also made clear that Mr Trump did not take kindly to being threatened - but it eschewed the insulting tones the US leader had used late last year when he called Mr Kim "little rocket man" and threatened North Korea with "fire and fury". Mr Trump's letter then segued into a very personal message, bringing it down to the two of them in one sentence. "I felt a wonderful dialogue was building up between you and me, and ultimately, it is only that dialogue that matters," he wrote. This is where analysts said the letter morphed into a "breakup" note. Certainly, it was typical of the President's tendency to take things very personally. The letter was unlike the usual dry language of diplomacy - which has never been Mr Trump's style. "It is authentic," a foreign diplomat in Washington told The Straits Times. "It is not the product of underlings and lawyers and multiple drafts. I wish more people would write like that." Releasing it to the public was also unorthodox, the diplomat noted. And no bureaucrat would threaten nuclear war. But most importantly, the letter left open the door to dialogue. 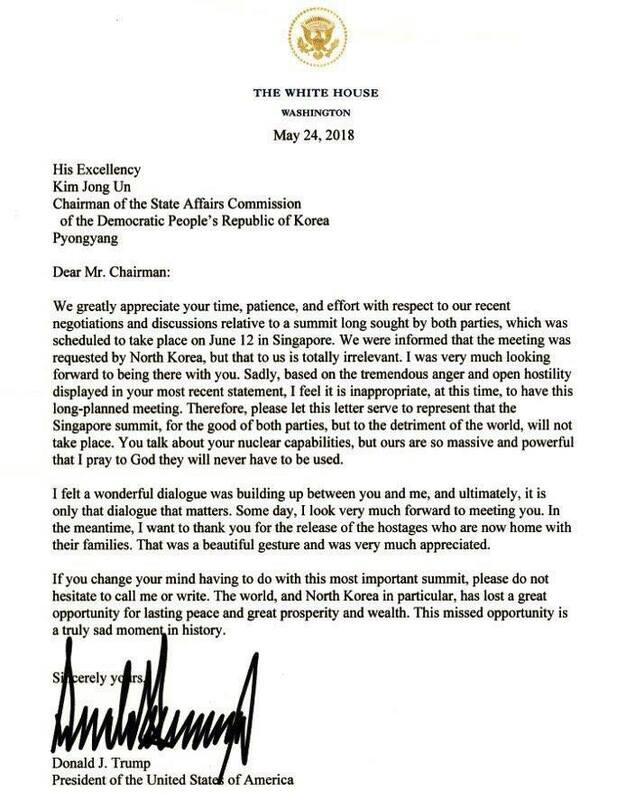 Mr Trump's usual bonhomie was missing - in keeping with the injured tone of the letter - but his signature casualness remained as he wrote: "If you change your mind having to do with this most important summit, please do not hesitate to call me or write." The diplomat who spoke to ST said: "It was like an e-mail to a friend. And it may have worked." 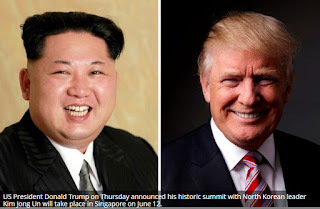 It is confirmed: Singapore will host the upcoming summit between United States President Donald Trump and North Korean leader Kim Jong Un on June 12. Mr Trump announced this in a tweet last night, ending weeks of speculation over the location for the first meeting between leaders of both countries. "The highly anticipated meeting between Kim Jong Un and myself will take place in Singapore on June 12. We will both try to make it a very special moment for world peace!" he wrote. Singapore said it is pleased to host the meeting between the two leaders. "We hope this meeting will advance prospects for peace in the the Korean peninsula," Singapore's Ministry of Foreign Affairs said in a statement. Mr Trump's announcement confirmed weeks of rumours that the Republic had emerged as a firm location for the upcoming summit. 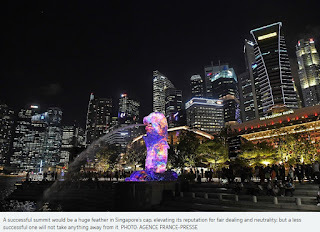 Singapore, touted for its neutrality, high degree of public order and track record in hosting high-level meetings, was among a list of venues floated for the summit. Mr Will Saetren, research associate at the Institute for China-America Studies, said: "The DMZ already had a historic summit. The optics a second time round would not have been so punchy. And President Trump going there would play into North Korea's propaganda machine - that the American President is coming to us. Singapore is a logical choice." In recent weeks, the shortlist was whittled down to Singapore and the Demilitarised Zone (DMZ) that divides the Korean peninsula. But on Wednesday, Mr Trump told reporters the summit would not be held in the DMZ. Without saying why, he said an announcement would be made in three days. Visiting US 7th Fleet commander, Vice-Admiral Phillip Sawyer, told local media yesterday that "the region and the world is cautiously optimistic and hopeful of what will come out of this (the meeting)". With Singapore being named as the venue for the meeting, experts The Straits Times spoke to weighed in on the merits of three possible locations in the Republic. A hospitality and events consultant, who did not wish to be named, said Shangri-La Hotel, which hosts the annual high-level Shangri-La security dialogue, is the top contender. "Logistically and security-wise, Shangri-La knows the drill... especially since it also hosts the Shangri-La Dialogue." Mr Toby Koh, group managing director of Ademco Security Group, noted that the security preparations in place for the dialogue taking place early next month makes it the ideal location, as there is no need "to replan and redeploy the security assets". MBS has been flagged as a possible venue for the summit, given that one of Mr Trump's major donors, Mr Sheldon Adelson, is chairman and chief executive officer of Las Vegas Sands Corp, which owns the Singapore integrated resort. The US President is known to take pride in being loyal to his supporters, and a high-profile meeting at MBS would give it priceless international publicity. Mr Koh, however, does not think it is a suitable venue, as MBS is too close to the busy city centre, and traffic in the area might mean that getting to and from the venue would be a hassle for officials and others attending the meeting. The facility's sprawling area also makes it very challenging for security personnel, he added. The island, with its relaxing surroundings, could be an attractive option, said experts. From the security perspective, there are also suitable sites on the island which are secluded and private, said Mr Koh. 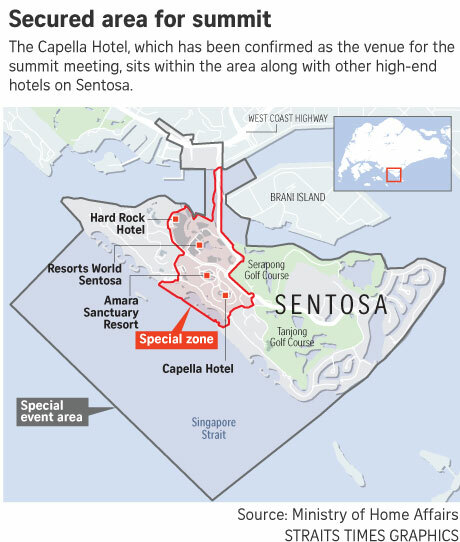 But hotels on Sentosa may not be able to host large entourages, said the hospitality consultant. 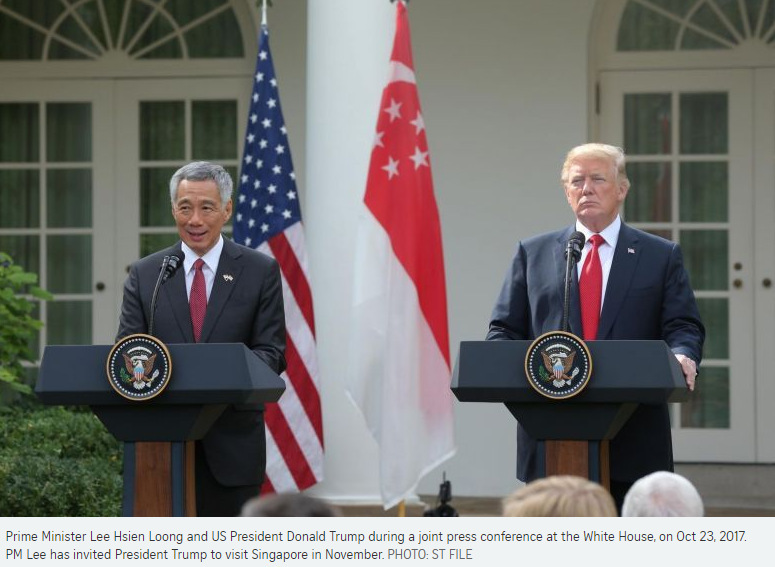 Prime Minister Lee Hsien Loong has said Singapore is honoured to host next month's summit between United States President Donald Trump and North Korean leader Kim Jong Un, during a telephone call with Mr Trump yesterday. Calling the summit a historic and momentous event, Mr Lee said Singapore would do its best to facilitate a smooth and successful meeting, according to a statement from Singapore's Ministry of Foreign Affairs (MFA). 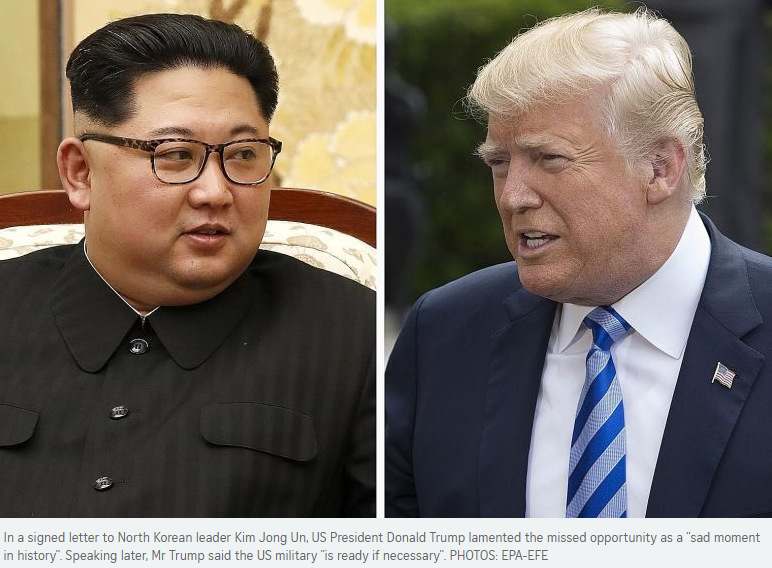 Mr Trump and Mr Kim will be in Singapore for their June 12 meeting, and the denuclearisation of North Korea is expected to figure high on the agenda. "This would be an important first step in the long process of securing lasting peace and stability on the Korean peninsula," the MFA statement on the telephone call said. President Trump thanked Mr Lee for hosting the summit. "He said there had been significant progress on this matter just in the last few months, and hoped that the summit would contribute to resolving this long-outstanding issue," the statement added. During the call, Mr Lee also invited the US leader to make a state visit to Singapore in November, in conjunction with the 6th Asean-US Summit and 13th East Asia Summit. Mr Trump replied that he would try his best to do so, the MFA said. Singapore was chosen as the site for next month's summit between US President Donald Trump and North Korean leader Kim Jong Un because of its neutrality and security, the White House's principal deputy press secretary Raj Shah told journalists. "Singapore has a relationship with both the United States and North Korea," Mr Shah told journalists on Thursday aboard Air Force One, which was taking Mr Trump and Vice-President Mike Pence to Indiana for a public rally. "They can be ensured - to ensure both the President's security and Kim Jong Un's security, as well as provide neutrality," he said, referring to the North Korean leader. "Singaporeans have been gracious up until now, and also in the past," he said. "In fact, on a historical note, the first meeting between the leaders of China and Taiwan took place in Singapore some years back." As of now, the summit would be a one-day affair, he said. "Right now, we are still planning out a lot more of the details. So, I don't want to get ahead of anything more specific." When asked what the President meant when he said on Thursday that the summit could be scuttled, Mr Shah said: "Well, we have over a month, right? We have a month and several days. And there are a number of things - provocative actions, for example, from North Korea would not be received well." "I don't want to offer hypotheticals. All I will say is that this meeting has been agreed to, but obviously it could be halted for any number of reasons." When asked about expectations of the summit, he said: "Our policy is to ensure the complete, irreversible and verifiable denuclearisation of the Korean peninsula. And that is what (the President) is going to be seeking." "I am not going to get ahead of the negotiations, but that is our… stated goal. It has long been a US policy in this administration, and it will continue to be. And we will see what happens going forward between now and June 12." Separately, Ms Victoria Coates, senior director for international negotiations at the National Security Council, told journalists that Singapore was convenient, and "it is a media hub for Asia". On Thursday night, Mr Trump confirmed in a tweet that the summit with Mr Kim would take place in Singapore on June 12. "We will both try to make it a very special moment for world peace!" he had said. Prime Minister Lee Hsien Loong said yesterday that the historic meeting was a significant step on the path to peace. In a Twitter reply to Mr Trump, he added: "May it lead to a successful outcome." Singapore's Ministry of Foreign Affairs (MFA) said in a statement on Thursday night: "We hope this meeting will advance prospects for peace in the Korean peninsula." Analysts were sanguine about the choice of Singapore. Mr Ernie Bower, chief executive of consultancy BowerGroupAsia, said: "Singapore is the ideal spot for the Trump-Kim summit because it underlines Asean's centrality at the core of developing Indo-Pacific architecture to promote peace and security." A Japanese newspaper yesterday raised the possibility of Chinese President Xi Jinping also travelling to Singapore on June 12. The Mainichi Shimbun's Washington-based correspondent cited US diplomatic sources as saying there was a chance that Mr Xi may meet Mr Trump and Mr Kim in Singapore. The Mainichi quoted a senior international negotiator with the National Security Council as telling reporters that "there is a possibility" the leader of a third country may take part. "Austria, a small and neutral state," its Federal President Adolf Scharf said in May 1961, "does not take part in the summit itself but the Austrians and the Viennese want to do everything they can to ease the implementation of the talks, and to make the encounter between the participants pleasant and comfortable." Those words set the stage for the historic first meeting between newly elected United States President John Kennedy and the mercurial Soviet leader Nikita Khrushchev. 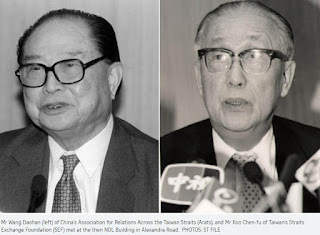 It is the merry month of May again and although in decidedly warmer climes, Mr Scharf's remarks may well frame the sentiments of Singapore's leadership. The island was last night confirmed as the venue for the landmark talks on June 12 between US President Donald Trump and North Korean leader Kim Jong Un. There is no shortage of comfortable locations for the two to meet. There is the Marina Bay Sands Hotel, the iconic hostelry owned by Trump supporter Sheldon Adelson, which is a quick ride on the "Beast" from the Paya Lebar Air Base that Air Force One has traditionally plonked down on, whether to ferry Mr Barack Obama here in 2009 for the Apec Summit or on the two visits his predecessor, Mr George W. Bush, made here in 2003 and 2006. Or, for a picture against a setting sun should the talks go well, a convenient location on Sentosa island may not be a bad idea. Still, more humble venues are not unknown. When presidents Ronald Reagan and Mikhail Gorbachev met in Reykjavik, Iceland, for their all-important summit in 1986, the venue was the former French consulate, a modest three-storey building. While the talks were not successful due to last minute hitches, it did lead to the Intermediate Range Nuclear Force Treaty inked the following year. When a city hosts two world leaders who are not short on enemies each, security is the biggest nightmare. As good hosts, the authorities will no doubt listen carefully to every demand put forth by the twin delegations. But often they tend to be excessive and it is sometimes necessary to put a heavy foot down. For instance, a visiting Indian leader may be used to having traffic blocked for him for an hour before his motorcade passes; in Singapore, that tends to be a matter of just minutes. Even so, there is little question that this is one meeting for which the local authorities will leave nothing to chance. Hence, there is an equally strong chance that it may, ultimately, fall to the Shangri-La Hotel to host the summiteers, if only because the local authorities are so used to mounting maximum security events there and sterilising it for security. That the summit will take place just after the annual Shangri-La Dialogue (June 1 to 3) would mean most of the security drills for the place would have been rehearsed by the time Mr Trump and Mr Kim sit down. A successful summit would be a huge feather in Singapore's cap, elevating its reputation for fair dealing and neutrality; but a less successful one will not take anything away from it. Back in 1995, when Singapore was touted as the venue for the inaugural summit of the World Trade Organisation to be held at the end of the following year, there were many hand-wringers in government. There was fear that Singapore's image would be dented if the talks, which involved several ticklish issues, failed. Others fretted that non-governmental organisations would disrupt the proceedings. In the end, hosting the summit cemented Singapore's reputation as the pre-eminent trading nation and the movement on several key issues that the summit achieved was just another layer on the kueh. Likewise, failure or lack of immediate success is not a shameful event for a third-party venue provider. In July and August 1985, India sought to organise peace talks in Thimphu, capital of the Himalayan kingdom of Bhutan, between the Sri Lankan government and the island's Tamil insurgents. Subsequently, even though the talks failed, the Thimphu Principles - a set of four demands set forth by the Tamils - became enshrined in the annals of foreign policy discussions. US Secretary of State Mike Pompeo has set a high bar for success: the immediate "permanent, verifiable irreversible dismantling of North Korea's weapons of mass destruction programme". It is important, therefore, to keep realistic expectations. North Korea's nuclear prowess was not built in a day and neither will its dismantling be rapid. While Singapore can expect Mr Kim to fly in and out, Mr Trump may probably choose to spend more time on the island. The tight strategic ties between the US and Singapore aside, he has reason to feel more comfortable here than in most other Asian spots - Singapore, after all, does not run a trade surplus with his country. And having flown all the way, it might make good sense to also turn it into a bilateral visit honouring a trusted friend. But there is another issue; more than twice the age of his 34-year-old interlocutor, it is a fair bet that his handlers would ensure the 45th President, who turns 72 next month, is well rested and alert before he sits down with the third of the Kim dynasts, who, despite his relative inexperience, has shown remarkable agility in his foreign policy. "He is not dumb, he is *** smart," Mr Kennedy is said to have remarked, as he read through the CIA's psychological profile of Mr Khrushchev, ahead of their talks. Nearly six decades later, that could be said for Mr Kim too. For his part, Mr Kim would probably have been told by Chinese President Xi Jinping, whom he visited in Dalian this week, that it would be prudent for him to keep his points short and not to speak for more than five minutes at a stretch. Aware of Mr Trump's short attention span, that is the way Mr Xi himself is said to have prepared for his evidently successful summit with the US President last year at Mar-a-Lago. Much interest will focus on whether the two decide to bring along their wives. Unlike in the days when Mrs Nancy Reagan and Mrs Raisa Gorbachev often vied for centre-stage, Mr Trump should have no fear that his wife Melania will be upstaged by the petite Mrs Kim. That said, there is always the threat that the husband gets upstaged at a key moment in his career by too much attention lavished on his spouse. Taken aback by the reception his wife Jacqueline received in Paris, Mr Kennedy was said to have been privately angry, even though he adroitly turned it into a famously droll moment by introducing himself at a major speech as "the man who accompanied Jackie Kennedy to Paris". One thing neither party will be short of on the island is home food. Mr Kim would know there are plenty of fine dining places that could supply him good kimchi or bibimbap, or if he were to follow his Swiss tastes, fine raclette. As for Mr Trump there always is Morton's of Chicago for a fine steak or Wolfgang Puck's Cut. Anyway you like it, and in more ways than one, Singapore is a moveable feast. 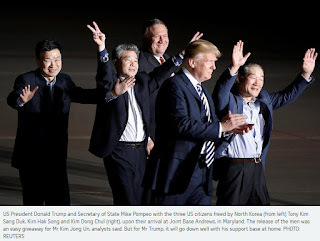 Three American nationals released from jail in North Korea were greeted on arrival by President Donald Trump and First Lady Melania Trump at a specially staged event at 2.40am yesterday at Joint Base Andrews outside Washington DC. It was a big diplomatic win for Mr Trump ahead of his summit in Singapore on June 12 with North Korea's leader Kim Jong Un. Mr Kim Dong Chul, Mr Tony Kim Sang Duk and Mr Kim Hak Song, who according to North Korean media were jailed for acts hostile to the state, were released by Mr Kim Jong Un as a goodwill gesture. They were escorted back to the United States by Secretary of State Mike Pompeo, who, just days into his new job, has scored a major diplomatic win for Mr Trump. Their release maintains the momentum towards the summit and addresses a concern in the US that Mr Trump may go into the meeting with little to show in the lead-up to it. Mr Pompeo told reporters on the flight home that it would have been more difficult had the men not been released. "I'm glad that we don't have to confront that." It was an easy giveaway for Mr Kim, analysts said. But for Mr Trump, it will go down well with his support base at home. "It is, for sure, a political plus for Trump," Dr Glenn Altschuler, professor of American studies at Cornell University, told The Straits Times. "All the more so, because it underscores his message that toughness gets results." Mr Pompeo arrived at the base just after 2am, followed shortly by a second plane carrying the three Americans, which parked in front of a gigantic American flag suspended between the extended ladders of two fire trucks. Mr Trump went into the plane first with Mrs Trump and spent a few minutes inside. Vice-President Mike Pence, his wife, and Mr Pompeo waited below the stairs. Then the couple emerged from the plane door with the three men, beaming and waving. The men flashed victory signs. "I want to thank Kim Jong Un," Mr Trump told journalists on the tarmac. "It was sort of understood that we'd be able to get these three terrific people during the meeting and bring them home after the meeting. And he was nice in letting them go before the meeting." "We're starting off on a new footing," he added. "This is a wonderful thing that he released the folks early. That was a big thing. Very important to me. And I really think we have a very good chance of doing something very meaningful. "I think he did this because I really think he wants to do something and bring that country into the real world. I think that we're going to have a... very big success. "My proudest achievement will be... when we denuclearise that entire peninsula. This is what people have been waiting for a long time. Nobody thought we could be on this track in terms of speed." Mr Pompeo's team in Pyongyang included Mr Brian Hook, the State Department's head of policy planning; and Mr Matt Pottinger of the National Security Council. Dr Victor Cha, senior adviser and Korea Chair at the Centre for Strategic and International Studies in Washington, wrote in an online comment that the release of the detainees should not absolve Pyongyang of "a history of human rights abuses that must be the topic of any discussion going forward on normalising political relations". But he added : "It is a good sign that the National Security Council and Department of State staff accompanied Secretary Pompeo, suggesting that more detailed pre-negotiations may be taking place to line up denuclearisation deliverables for the summit." 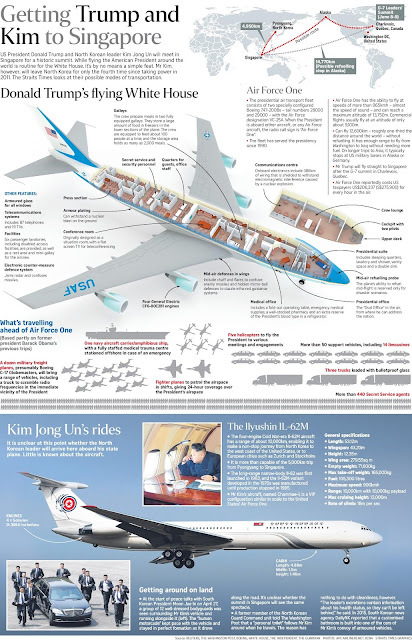 North Korean leader Kim Jong Un, who is likely to be accompanied by his sister Kim Yo Jong and other key officials when he meets US President Donald Trump in Singapore next month, may fly here on his Soviet-made long-range aircraft, the Ilyushin-62 (Il-62). This same aircraft on which he flew to Dalian, China, earlier this week can easily cover the 5,000km distance between Pyongyang and Singapore, experts said. While it is possible that both he and Mr Trump, who will arrive on Air Force One - the US President's plane - could land at Changi Airport, Paya Lebar Air Base makes more sense, security experts said. A day after it was confirmed that the historic summit will take place in Singapore on June 12, attention has turned to where the talks will be held, how the two leaders will arrive and where they will land. Much is known about Air Force One, but very little about the North Korean leader's official aircraft. Mr Kim's visit to China was his first reported international flight after he assumed power in 2011. 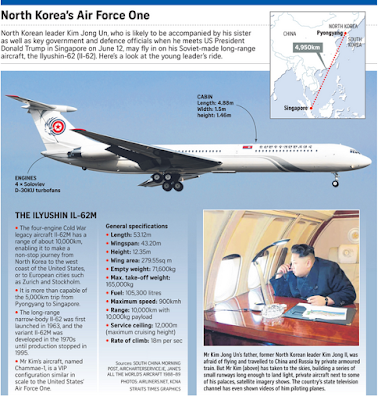 The IL-62 is also operated by North Korea's national carrier Air Koryo. Aviation enthusiast Sim Kok Chwee said: "I flew the same aircraft from Beijing to Pyongyang in 2004 and was quite impressed with the airline's service level, although there was no in-flight entertainment. Air Koryo, which presumably maintains the country's state aircraft as well, would also be required to meet all global safety and other standards." There is some speculation that the North Korean leader could borrow a plane from China for the meeting in Singapore, but Ms Sarah Teo, associate research fellow at Nanyang Technological University's S. Rajaratnam School of International Studies, said it is unlikely. "Flying in on his own aircraft would fit the narrative of North Korea's independence and strength coming into the meeting," said Ms Teo, who has been following developments on the Korean peninsula for about a decade. Where the two leaders will land in Singapore is a more critical decision, experts said. Mr Michael Daniel, a retired US aviation official who now runs his own consultancy, said: "This requires careful consideration and coordination between the countries involved - Singapore, the US and North Korea - as well as the various security and other government agencies within each country." Dr Bilveer Singh, senior adjunct fellow at the S. Rajaratnam School of International Studies, said: "As a major commercial airport, flights at Changi Airport could be disrupted if, for any reason, the air space needs to be closed temporarily to accommodate the high-level flights. "It is also important to note that we are dealing with two leaders and states that are paranoid about security. The reason the summit is being held here in the first place is partly because they are confident that Singapore can and will offer 101 per cent security. If this is the key consideration, landing at Paya Lebar is the best option." The 15th floor of a mundane office block in North Bridge Road is shared by 10 tenants, including a language school, a business equipment supply firm and a food and beverage company. Along the nondescript corridor that links the offices - and with almost nothing to set it apart from the others - is a door next to a bronze sign and security pin device. 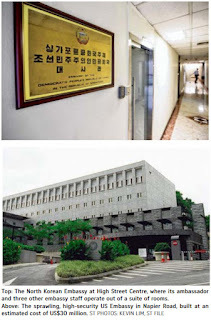 Welcome to the Embassy of the Democratic People's Republic of Korea. North Korea's diplomatic mission in Singapore goes almost unnoticed. However, its situation says much about the country's image here, especially when compared to the sprawling, high-security United States Embassy in Napier Road, built at an estimated cost of US$30 million (S$40 million). The US Embassy, flanked by Singapore's Ministry of Foreign Affairs, the British High Commission, the Australian High Commission and China's embassy, features a reflecting pool, a landscaped colonnade and materials including Minnesota granite and Vermont marble. Meanwhile, behind a frosted glass front door, North Korean Ambassador Kim Chol Nam and three other embassy staff operate out of a suite of rooms in High Street Centre, an unassuming building which overlooks Clarke Quay and stands opposite Parliament House. The embassy operates from 9am to noon and 2pm to 5pm on weekdays. It reportedly moved to its current site in 2016 from a "five-bedroom, 7,500-sq-ft house" at 60, Joo Chiat Lane. Before that, it was located at Golden Mile Complex. Singapore established diplomatic relations with North Korea in November 1975 and with the United States in April 1966. US relations with Singapore go back to 1836 when Joseph Balestier was appointed as the first consul-general, according to the US Embassy website. His wife was the daughter of American revolutionary Paul Revere, famous for warning "the British are coming" on his midnight ride. Singapore will solidify its reputation as a politically neutral and secure place by hosting the historic summit between United States President Donald Trump and North Korean leader Kim Jong Un on June 12, said foreign policy experts. Mr Trump confirmed Singapore would host the meeting in a tweet last Thursday. "It is a definite plus, that we are seen to be secure, trusted, neutral," said Professor Chan Heng Chee, chairman of the Lee Kuan Yew Centre for Innovative Cities at the Singapore University of Technology and Design, and Singapore's former ambassador to the US. Associate Professor Alan Chong, from the S. Rajaratnam School of International Studies, reckons the choice of venue endorses "Singapore's centrality and neutrality, the DNA of our foreign policy". Some observers have described the decision as a diplomatic coup, citing Singapore's small size. Being deemed suitable for such a landmark meeting by both the US and North Korea underscores Singapore's relevance to the world, said veteran diplomat Ong Keng Yong. He cited the country's track record in hosting other high-level diplomatic meetings in the past. In 2015, Singapore played host to a historic meeting between Chinese President Xi Jinping and then Taiwanese President Ma Ying-jeou - the first time top leaders from both sides met since 1949. In 1993, the Republic also hosted the Wang-Koo meeting - named after Mr Wang Daohan, chairman of China's Association for Relations Across the Taiwan Straits, and Mr Koo Chen-fu, chief of Taiwan's Straits Exchange Foundation - a landmark meeting where Taiwan and China discussed bilateral ties. Mr Ong said North Korean and South Korean officials have also met in Singapore in the past. "By coming here, it reaffirms that we have the political and strategic qualities which facilitate high-level, sensitive diplomacy, and in the long run, it will help to boost Singapore's standing among our Asean neighbours and countries of the world." Prof Chan said: "It's also because we're seen to be a discreet country. That's very important in the run up, especially when you're doing a lot of planning for such a highly sensitive meeting." While there may be inconveniences resulting from security arrangements like road blocks, Mr Ong said these are a small price to pay as "this is something money cannot buy", noting that other countries had offered to host the meeting. Other venues considered include the truce village of Panmunjom in the demilitarised zone between the two Koreas, and Mongolia. The outcome of the Trump-Kim summit - whether successful or not - will not harm Singapore, said Prof Chan. "It is in the nature of difficult talks and conflict-resolution talks that they take a long time. It is a process." 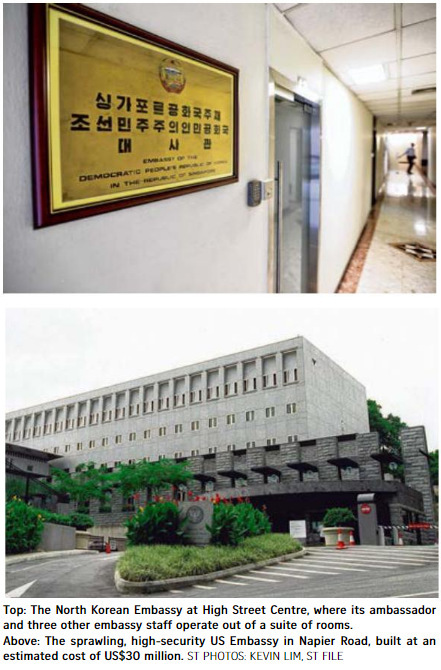 The Republic is among a small number of countries which has diplomatic relations with both the US and North Korea, which each have an embassy here. It is a close partner of the US in the region, and established diplomatic ties with North Korea in 1975. All rooms at the Shangri-La Hotel and Marina Bay Sands - the two likely venues for the historic meeting between United States President Donald Trump and North Korean leader Kim Jong Un next month - have been snapped up by yesterday afternoon. 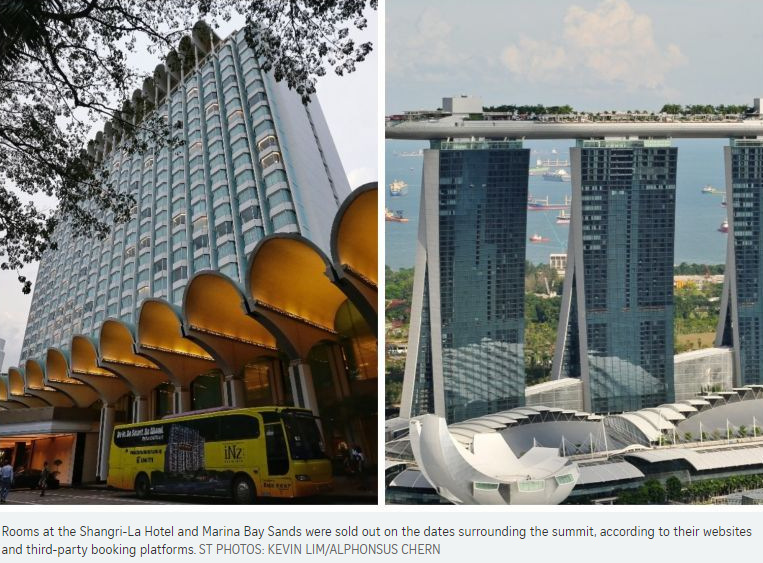 Checks by The Straits Times on their websites and third-party booking platforms such as Expedia and Booking.com showed that rooms were sold out on the dates surrounding June 12 - the date for the summit. President Trump had announced in a tweet on Thursday night that the first meeting between the two leaders would be held in Singapore on June 12, ending weeks of speculation on the venue of the summit. Shangri-La Hotel, which hosts the annual high-level Shangri-La security dialogue, has been touted by observers as the most likely venue for the meeting. Shangri-La said in a statement yesterday that while it is pleased that Singapore will host the upcoming meeting, "the hotel has not received confirmation on the venue and is not in a position to make any comments on behalf of the stakeholders involved in the preparation of this summit". 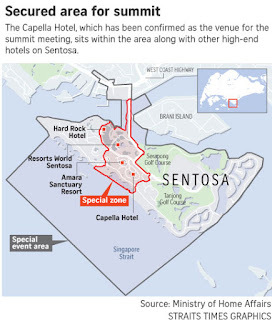 Sentosa and integrated resort Marina Bay Sands (MBS) had also been touted as possible locations for the summit, though sources told The Straits Times that the competition had been narrowed down to either Shangri-La or MBS. MBS is owned by Las Vegas Sands Corp, of which major Trump donor Sheldon Adelson is chairman and chief executive officer. MBS declined to comment. Meanwhile, hotels located close to both venues said they are bracing themselves for higher demand over the period to accommodate the spillover of foreign media and dignitaries. Orchard Hotel was appointed the official media centre and caterer for the recent Asean Summit, held at Shangri-La some 500m away, general manager Byron Chong told The Straits Times. The hotel has seen more interest for the period of June 9 to 14, and will continue to monitor room reservations, he said. Other Orchard Road area hotels, including Singapore Marriott Tang Plaza Hotel, are also anticipating an increase in bookings. Royal Plaza on Scotts general manager Patrick Fiat said the hotel hopes the event will have a positive impact on business, amid relatively slower bookings for June this year. Pan Pacific Singapore, located near MBS, expects an average occupancy rate of close to 90 per cent next month, but can still accommodate some requests, said general manager Gino Tan. The hotel has played host to several heads of state as well as several high-profile events, including the Asean Tourism Forum, in the past year, and it is "well prepared to support the influx of guests in conjunction with this special event", he said. 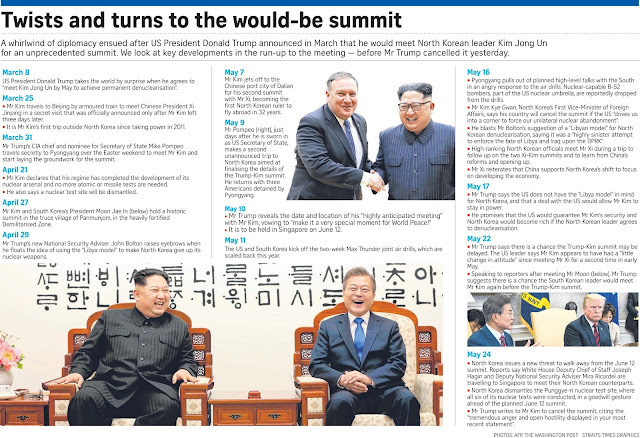 Most Singaporeans are in favour of the Republic hosting the historic summit between US President Donald Trump and North Korean leader Kim Jong Un, a Straits Times poll has found. Of the 140 people surveyed, around 70 per cent expressed their support, with 20 percent objecting and the rest undecided. "This is a crazy privilege, and Singapore is lucky to have it," said 57-year-old taxi driver Wong Kee Seong. "The world will see Singapore as an open and neutral ground for international discussions, even if the two leaders themselves are a little bit controversial." Others were also excited at the prospect of the international spotlight falling on the city. Ms Joanna Lee, 35, who works in marketing, said the summit will "put Singapore on the map for being more than just a clean and green city, but now also a global player for international policy". A cabby who only wanted to be known as Mr Wong, in turn, said: "This is going to be in the history books, and we are lucky because we Singaporeans are going to be in the history books too." For those who would rather the summit be held elsewhere, they cited issues such as security threats and the controversial nature of both Mr Trump and Mr Kim. A 39-year-old sales executive who only gave his name as Jeremy said: "Both leaders are politically unconventional, with neither side representing Singapore's own views. We may be seen as too accommodating and may be expected to be this open in the future." On security, a number of respondents were concerned about the level of security required to host such a high-profile summit. Student Matthew Teo, 21, felt such increased security "may inconvenience many Singaporeans going about their daily lives, what with all the traffic and extra security checks". On a lighter note, Singaporeans unsurprisingly also had many food recommendations for the two leaders. Chicken rice was the top recommendation, voted for by 34 per cent of respondents, followed by chilli crab and laksa. Mr Dextor Chow, 20, who is entering a local university in August, believes food helps to unite people. He said: "Chilli crab symbolises the different influences of different cultures in Singapore, and that having differences would help us understand one another better." Some suggested that Mr Trump may prefer to take the dishes with less chilli. Respondents were also asked to recommend a local destination for the two leaders to visit. Almost 30 per cent recommended Gardens by the Bay, with Marina Bay Sands and Sentosa also making the top three. Business director Margaret Siew, 52, said she could imagine the two leaders settling their disputes over a few sandcastles at one of Sentosa's beaches. "How can you not feel calm and at ease at Sentosa, with your toes in the sand and the sun on your back?" she said. The choice of Singapore as the venue of next month's summit between US President Donald Trump and North Korean leader Kim Jong Un reflects the city-state's diplomatic prowess. Certainly, Singapore offers another advantage, that of security. Its importance cannot be over-emphasised in the organisation of talks between Mr Trump and Mr Kim. Considerations of security must have loomed large in the calculations of the White House. The security surrounding the American President is legendary, and understandably so. In the case of the North Korean leader, his physical security not only symbolises that of his state but underpins it materially as well because of the highly personalised nature of the regime. Singapore has a track record of holding international gatherings free of security incidents or disruptive public protests. However, the larger point is the diplomatic one: Singapore works hard at being no one's enemy. Thus, it refused to demonise the Soviet Union during the Cold War although its economic and strategic interests lay clearly with the West. Its determined diplomatic opposition to the Vietnamese invasion of Cambodia was not born of ideological hostility to Vietnam's Leninist system but of a refusal to accept the invasion as a fait accompli. In like spirit, Singapore treated China as a great power with legitimate interests; Beijing's political system was a domestic matter. Singapore punches above its weight in world affairs because it does not throw ideological punches. Neutrality comes naturally to a small state, as it should, unless an international issue impinges on its sovereign interest. Being neutral does not mean having no view and never speaking up when it matters. The results of that approach have been manifested in Singapore's facilitation of conference diplomacy. It hosted the historic Wang-Koo talks of 1993, which brought together Mr Wang Daohan of China's Association for Relations Across the Taiwan Straits and Mr Koo Chen-fu of Taiwan's Straits Exchange Foundation. Singapore's One-China policy allowed it to play a facilitative role in the crucially sensitive matter of cross-straits relations. The trust generated by its reputation as an honest broker culminated in the meeting between Chinese President Xi Jinping and then-Taiwan President Ma Ying-jeou in Singapore in 2015. 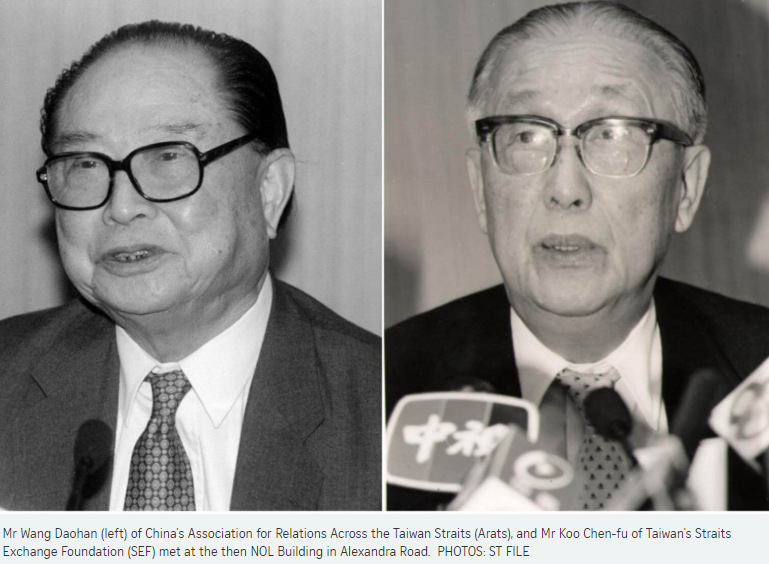 The parleys were the first between the top leaders of China and Taiwan since the end of the civil war in 1949. World attention today is focused on the possible denuclearisation of the Korean peninsula. That would remove a key flashpoint in North-east Asia that impinges on the strategic interests of the United States and China. While Singapore cannot influence outcomes, it is significant that it has been chosen as the site of the North Korean-American summit. Mr Kim understands that Singapore bears his regime no ill-will. Instead, it would applaud the making of peace on the Korean peninsula. Whatever Mr Kim and Mr Trump decide, Singapore will help make diplomatic history. It is important for the world - including Singapore - to help the peace process through a historic summit on Tuesday between United States President Donald Trump and North Korean leader Kim Jong Un, said Home Affairs and Law Minister K. Shanmugam. Describing the summit taking place at the Capella hotel on Singapore's Sentosa island as a "major show of confidence" in the Republic, Mr Shanmugam also explained Singapore's interests in contributing to the peace process. With Singapore seven hours away by flight from the Korean peninsula and about 20 minutes away by missile, any incident in that region will affect the country badly, he told reporters yesterday. "You have a nuclear-capable North Korea. You have American troops in South Korea. And, saying the obvious, the US is a nuclear state," said Mr Shanmugam. Any incident during this "period of tension" will be bad for the world, including Asia and Singapore, said the former foreign affairs minister, stressing that Singaporean jobs, trade and investment could be affected. With all these at stake, local security forces have been "working around the clock" to ensure a successful summit, said Mr Shanmugam, adding that "very detailed" plans are in place, with thousands of security personnel being deployed and national servicemen recalled. "They believe that we, Singapore, can provide a safe and secure venue... We are a little red dot, but we are a serious member of the international community," he added. While there has been online chatter showing displeasure at the fact that Singapore is footing the bill for the security and logistics of the summit, Mr Shanmugam said he believed most Singaporeans understood the importance of the event. He said Singapore takes a "no-nonsense approach" to security, and highlighted the incident on Wednesday where Australian Zeky Mallah, 34, was denied entry on account of his previous terror-related activities. He also touched on the case on Thursday where two South Korean media personnel were arrested for trespassing on the North Korean ambassador's home, saying it is being investigated. "We take this sort of thing seriously and, of course, we will put a stop to it and will investigate if people are reported or if we find out," said Mr Shanmugam. Malaysia's richest man Robert Kuok does not need the business. But business he will get at his Shangri-La Hotel in Singapore - heavily tipped to be hosting United States President Donald Trump and his delegation this week. Mr Kuok tells The Sunday Times: "I naturally feel happy for Shangri-La." But he has more than dollars and cents on his mind. The 94-year-old said: "Like everyone else, I share feelings of happiness - although some small feeling of anxiety in case things go wrong - that Singapore is hosting such a major historic event. "I hope the summit will bring good and beneficial results to all of us living on this planet." Indeed, hopes are high that Tuesday's event - an unprecedented meeting between Mr Trump and North Korean leader Kim Jong Un, who is Chairman of the State Affairs Commission - will eventually yield "a bountiful harvest" in peace dividends, as Foreign Minister Vivian Balakrishnan put it yesterday. 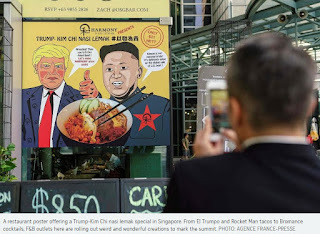 More immediately, hosting the DPRK-USA Singapore Summit - as it is called - will benefit Singapore both in economic and strategic terms, said observers. The event will be a boost for industries including hotels, restaurants and security, helping to create some jobs, as well as burnishing Singapore's image on the international stage. This will likely outweigh the costs, risks and inconveniences associated with playing host to the high-profile summit, they added. Crunching the numbers, CIMB Private Banking economist Song Seng Wun said the immediate spike in hotel and other tourism-related spending will reach tens of millions. This is based on Singapore Tourism Board estimates that each visitor to Singapore spends an average of $1,500 over a 3 1/2-day stay. More than 2,500 journalists have registered to cover the event. Officials from the US, North Korea and other countries will number in the thousands too. 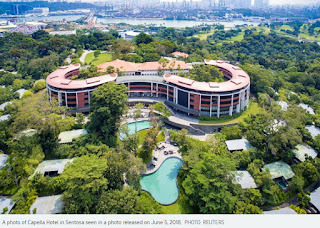 Besides Shangri-La, the other two hotels playing key roles are The St Regis Singapore, where Mr Kim is expected to stay, and the Capella Singapore hotel on Sentosa, where the summit is taking place. Incidentally, all three are owned by Singaporeans or a Malaysian, as in Shangri-La's case. And then there are tourists who make last-minute plans to travel to Singapore "to experience this historic occasion", said Ms Zarina Othman, a director at conference organiser MCI Singapore. A summit also generates spending on private security services and equipment. For instance, Certis has been appointed one of the service providers. Businesses are also looking to cash in, with a slew of offerings, from Trump-Kim burgers to summit souvenirs to T-shirts. Singapore's reputation as a foodie paradise could also get a polish, with foreign journalists offered a taste of local fare like durian ice cream, nasi lemak and chicken briyani. "It is a golden opportunity to show how unique Singapore's food and beverage identity is," said Mr David Yim, co-founder of Udders Ice Cream, part of the consortium The Common Good Company, which is sponsoring food products at the International Media Centre. But being placed under such an intense international spotlight comes with risks and costs. If there is a security breach, for example, the damage to Singapore's reputation will be severe, said Dr Tomoo Kikuchi of the S. Rajaratnam School of International Studies (RSIS). Then there are costs, like the inconvenience to the public from road closures and events cancelled due to clashes with the summit. Some businesses may see lower takings. Retailers may be affected if security measures disrupt foot traffic, said Mr Mark Shaw, chairman of the Orchard Road Business Association. Dr Graham Ong-Webb of RSIS believes there should be compensation for businesses adversely affected by the summit. The biggest cost item of all is the cost of security arrangements. Singapore has said it is footing the bill. Asked about the estimated total cost, Dr Balakrishnan said he did not have the figures, but added that it will be substantial, as it is a "major security operation". "Every dollar is spent appropriately," he said. "This is... an enormous affirmation of Singapore's value proposition to the world." Analysts concur, saying that the long-term positive impact on Singapore Inc is likely to be big. The summit enhances the value of the Singapore brand, associating it with being safe, secure and trustworthy, said Mr Serguei Beloussov, chief executive officer of tech company Acronis, headquartered in Singapore and Switzerland. "If you didn't know where Singapore was before, you would now," added Mr Song. While many international events like the Formula One race reach niche audiences, a major political summit reaches a mass international audience, he said, estimating the total boost to the economy to be in the billions over a decade. Beyond economic benefits, there are strategic ones as well. Dr Ong-Webb said Singapore could also become the go-to place for all high-level conflict resolution summits. Hosting the summit well also projects Singapore's soft power and wins it goodwill with the US, North Korea and other countries, said Dr Alan Chong of RSIS. He said: "Singapore may become the economic and diplomatic gateway between the West and the East."